Improved feed conversion rates and liveweight gains have been the result of altering the diet for beef breeding and store cattle on a Scottish Borders upland farm. Monthly weighings of youngstock over the last two years have shown that heifers and commercial bullocks at Poldean, Wamphray, near Moffat have averaged more than 1kg daily liveweight gain while pedigree bulls have easily achieved 1.75kg. Willie Davidson, who runs Poldean with his wife Jennifer and son Alisdair attributes the improvement to the switch from a pelleted feed in his complete diet feeder to a custom-made meal geared to optimising rumen function. The Davidson’s farm almost 2,000 acres that climbs from 270ft to 1,760ft, running 300 cows, including a small number of pedigree Charolais alongside a majority of Salers, a third of which are now pedigrees. The French Salers breed, which is reknowned for easy calving and good milk production, has been at Poldean since the early 1990s, but when the farm’s beef cattle and sheep were culled out in the 2001 foot and mouth epidemic the Davidsons had to re-establish their herd. This created the opportunity to purchase foundation stock from France, including the bull that was champion at the local show in the Salers region. Now the aim is to minimise disease problems by running a closed breeding policy, with only Charolais and Salers bulls bought in as well as rams for the 500 ewe Lleyn flock. Half the cows go to the Charolais and the remainder to the Salers, and the original thinking of sticking with pure breeds for the crossing programme - as they do in France - was that it made for a more consistent product and avoided the Holstein influence found in many cross suckler cows today. “Currently the cattle are a mix of pedigree and commercial although the aim is to go totally pedigree Salers,” said Willie Davidson, who is not one for following the local trend as visitors to Poldean when it hosted Scotsheep in 2004 discovered. The main calving period is May and June, with bullocks and Charolais heifers not for breeding sold the following May as yearling stores in Lanark, Lockerbie and Castle Douglas. The calves are introduced to creep feed in September while still outside to get them eating feed and to reduce stress at housing time, helping to prevent pneumonia. At housing, which can be from late September to the beginning of November, they are fed a complete diet of silage and the specialised meal. “We switched to the meal two years ago on the advice of Bill Souter, nutritionist with Davidson Brothers, of Shotts, Airdrie. “He advised using the meal in the mix with clamp silage to prevent the cattle sifting out the concentrate. It’s a very simple system. The calves are fed ad-lib and we analyse the silage each month and alter the diet according to the silage quality and the growing needs of the cattle. “We have also weighed the calves every month for the last two years. This is a very important aid to management, with the weights showing if something is not right with the cattle. We also get the chance to get a close look at the calves, and handling keeps them quiet. We record all the weights on computer. The meal contains three types of cereal to provide a balanced energy release from starch, plus digestible fibre for slow energy release in the form of beet pulp. There is also a concentrated alfalfa extract to simulate eating quality akin to grass fed beef, a rumen protected high-energy oil, and seaweed meal to promote health. Alisdair Davidson with the show cow Chapelpark Trudy. Improved rumen function is achieved through the inclusion of Alltech’s live yeast culture Yea-Sacc1026. This product works by stimulating the fibre-digesting bacteria in the rumen and therefore improves the utilisation of the ration, and in particular the forage component. In beef cattle the proven effects are to improve intakes, increase growth rates, and generally boost the condition of the animal. The improved system benefits all the youngstock. Between 10 and 15 Salers breeding bulls are sold off the farm each year at one to two years old mainly to commercial producers in the north of Scotland. Mr Davidson says the feeding regime gives the bulls bone structure and grows them well, but not to the extent of fattening them so that they ‘melt’ when they go out to work. Likewise bulling heifers sold through Castle Douglas mart mainly into Aberdeenshire are in a fit condition with 15 month old heifers averaging just under £600 – and probably more with the lifting of the OTMS. The heifers have plenty of growth and are big enough to calve at two years old. Store cattle have recently sold to £588 for a pen of six 11-month-old Charolais cross bullocks at Castle Douglas, with Charolais cross heifers making to £480 at Lockerbie. 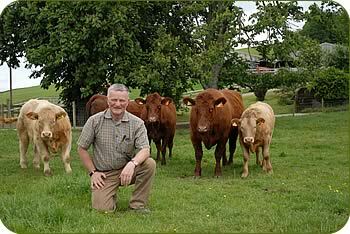 A past chairman and current president of the Salers Cattle Society, Mr Davidson, along with his wife Jennifer, also shows pedigree cattle. 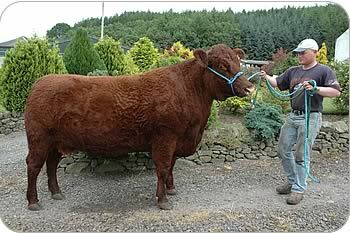 In 2005 they won the bull of the year title awarded by the society with their imported bull Portos, which was male champion at both the Royal Highland and Royal shows and reserve supreme champion at the Highland last year. They also won female of the year in 2005 with their cow Chapelpark Trudy, now carrying her third calf, which was Royal Show supreme champion.